A familiar call to arms, and one that became acutely appropriate across the days I spent in Copenhagen at the Youth Fashion Summit and it’s elder relative, the Copenhagen Fashion Summit (CFS) – “the world’s leading business event on sustainability in fashion”, convening industry leaders, disruptors, change-agents and policy makers around the most pressing issues facing one of the most expansive and complex industries of our world today. Time, as a resource, is hard to manage. On a daily basis, we are all engaged with tweaking our mental schedules to find more of it. Whether in a moment of reflection hovering over a fresh morning brew, or in the bliss of the late afternoon either with plenty to still tick-off or plenty to reflect on – the ways in which to use time seem both endless and compounded within the day, let alone week. Partaking in a 12-month MBA programme, this sentiment is felt regularly, personally and collectively as a cohort. And it is often shared, shiveringly, by those with whom we describe the variety of subjects and intensity of schedules this quite unique ‘One Planet MBA’ programme offers. However, arriving at the Copenhagen School of Design and Technology (KEA) a little over a week ago, in what seems to be one of the most blissful and effortlessly sustainable cities in Europe, the sentiment described was due for a true test, as 3 days of brainstorming, debate, scenario-planning and synthesising were due to ensue. 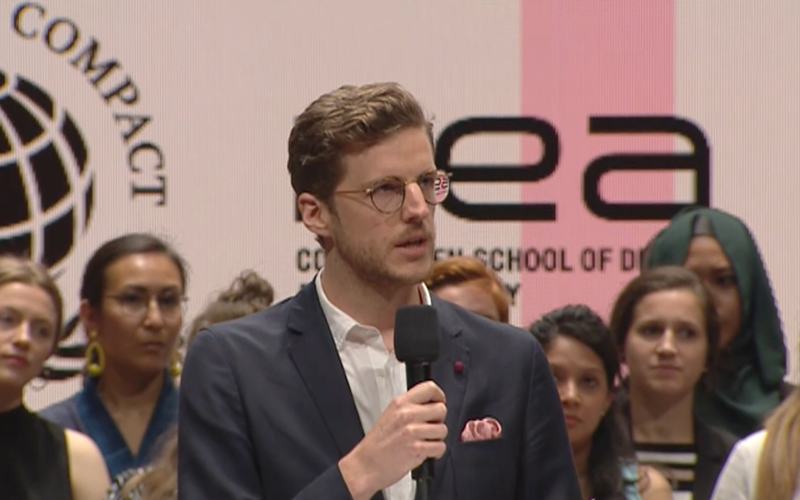 Under the flag of the Youth Fashion Summit, in a somewhat gauntlet-style waterfall of workshops, 110+ students from 36 countries, and 64 of the world’s top design and business schools, gathered to kick off a 2-year programme aimed at challenging industry leaders’ engagement with SDGs 3 and 5 at the Copenhagen Fashion Summits of 2018 and 2019, while working in partnership with a leading luxury retailer, PANDORA, on their own sustainability story. Day 1, Sunday – meet and greet, review of pre-assignment and alignment on goals and objectives. ‘Pre-assignment’ – yes. Soon after I was accepted to the programme, after having to write a 500 word application, we were delivered a reading list and a pre-assignment to be completed in solo. 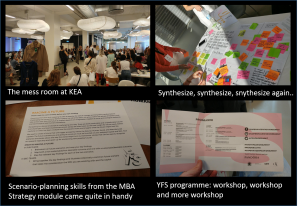 This went some way to already dispel any skepticism that this was going to be a ‘youthful’ jaunt in the Nordic sunshine with post-its and mind-maps. Nevertheless, the pre-assignment – with its focus on crystallizing a personal perspective on the implementation, or lack thereof, of the assigned SDG (5 in my case: gender equality, vs 3 for others: health and well-being) and the assigned ‘capital’ (human in my case, out of social, natural and manufacturing for others) within my country of choice (UK) – developed a broad scope of knowledge and perspectives within the groups we were assigned to. 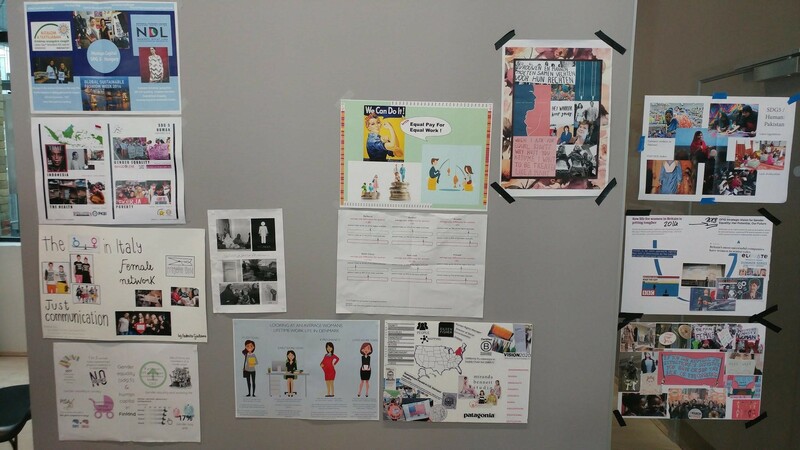 We met and greeted each other on that first day by presenting, via mood-board, how either our national government, industry leaders or societal commentators had or had not yet delivered on the many aspects of gender equality and empowerment. 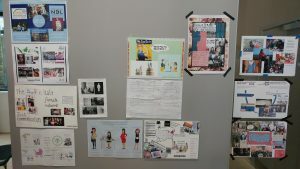 With only a few relating their mood-board presentations to fashion, it was clear the ideas to come through the rest of the week were set to be diverse. 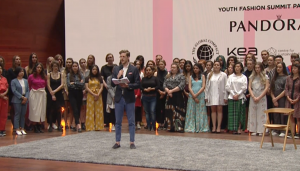 The overarching goal of the Youth Fashion Summit programme was for the cohort to develop a set of ‘demands’ relating to the implementation of SDGs 3 and 5 by 2030, which would be presented to the industry leaders attending the Copenhagen Fashion Summit the same week. This was achieved, impressively, by employing a rigorous yet well-managed waterfall-type approach of workshops, each with specific objectives, feeding into the overarching goal, along with related outputs such as the keynote speech and graphic poster production (evidence to come below). A ‘future fashion narrative’ was created by each of the 14 groups to support the final outputs, so as to capture the collective and diverse voice of this next generation of industry leaders. Alongside the 8 groups of 14 students each – comprised of Bachelors level, to Masters, to industry-veterans returning to take Masters or MBAs – a cohort of about 20 ‘experts’ and ‘facilitators’ fluttered between assigned groups and capitals. This investment in the support as well as execution of the process was most impressive, and went further to dispel any leftover skepticism. Having been through a variety of similar brainstorming type workshops within and extra-curricular to the MBA, I could say I have an experienced mind and hand with the post-it. However, I would just as quickly put both my hands up and say there are times where the process is lost on me, or the group seems to be floundering with details, in which a steadying voice from outside the post-it bubble is more than welcomed. A balance was well struck between the experts and facilitators guiding and probing these newly formed microorganisms of groups, and allowing them to evolve and find their own voice. Complimented by the rich relationships with partScsner organisations, a highlight of the programme for many cohort members was the negotiation session with ‘stakeholder representatives’. This gave the groups the opportunity to present their vision and demands to members from organisations ranging from highstreet to luxury retailer, NGO, supply chain specialists, UN body and media. 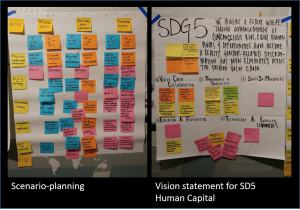 Through negotiations, groups were able to refine their vision and demands to both align the language and stretch certain aspects even further, given that the scope of the demands are the SDGs, which are due to be achieved by 2030. A 10 minute speech, capturing the essence of the YFS cohort’s demands and vision for a future fashion industry they would be proud to inherit, presented to the Summit delegates as the opening keynote speech on the day 2 of the CFS. I was fortunate enough to be selected as one of 8 speakers, representing each group, to speak on stage on behalf of my fellow cohort members standing 100+ strong behind me. 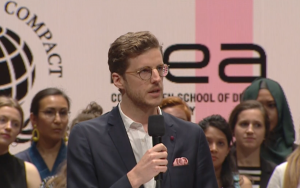 The privilege to speak on behalf of gallons of sweat, tears and ideas from 100+ passionate change-agents, let alone on a topic so relevant and critically in need of address – gender equality and empowerment – was immense. To do so on stage in an awe-inspiring concert hall, in front of industry leaders and change-agents wrestling with the complexity of their business and its impacts, was something I won’t soon forget. The theme of this years Copenhagen Fashion Summit was ‘words into action’, given that, at last year’s Summit, a commitment to a circular fashion system was signed by almost 12% of the global industry. Therefore, measuring the commitments’ translations to action will be of primary focus for the CFS team moving forward. Some key insights from attending the main Copenhagen Fashion Summit, after the thrill of presenting on stage, highlighted the complexity of the challenges the industry is faced with. While it may appear a visually expressive industry with the catwalks and billboards, it also embodies some of the most complex and murky global supply chains. 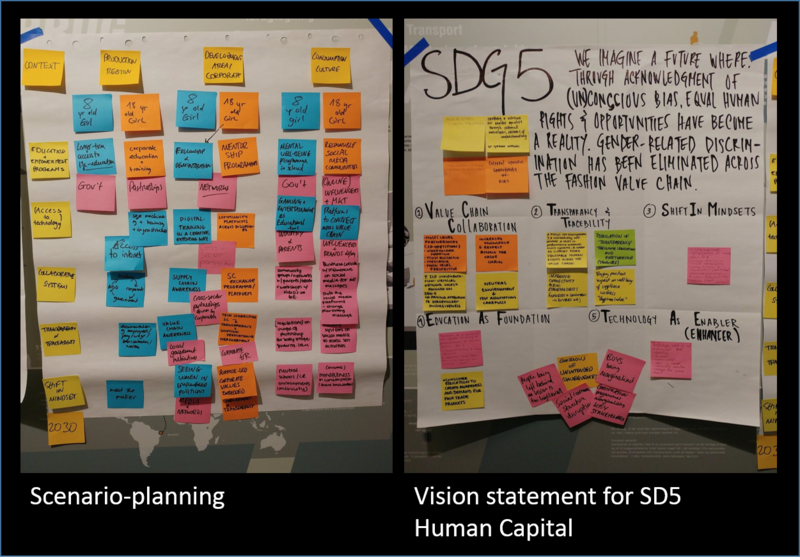 Compounded by an entrenched lack of transparency, a topic of great debate and emphasis during the Summit, this creates an immense challenge for change-agents to grasp elements of the value chain in need of redesign or redistribution. A particular highlight across panels and presentations were points made about consumption and the relevance of it to a circular industry model; specifically that – as posited by Levi’s VP of Product Innovation – circularity is very hard to get right, but, as it appears the only way this industry is going to survive sustainably, achieving circularity will most likely constrain the size of the industry and its output to an appropriate size, for the planet and its people. A sentiment that resonates with the narratives and demands developed by the YFS cohort, and one we hope to explore further in round 2 of the programme. The Youth Fashion Summit’s evolved 2-year programme looks to echo this sentiment and that of the CFS’ theme, by taking the demands developed and working them into a sustainability strategy for the programme’s brand partner, Pandora – a leader within a sector, jewelry, that has yet to deeply engage with sustainability. Therefore, I am thrilled to be returning to Copenhagen next year to complete the process and deliver an actionable strategy to the industry and an emergent sector in the sustainability space. Ultimately, the programme truly demonstrated what can happen when you bring together curious minds, creative hands, informed ideas and really committed hearts and souls. Furthermore, given the underpinnings of fashion as a creative engine geared towards celebrating diversity through evolving expression and change, it presents itself as an ideal way to address the global challenges we face on a grand, beautiful scale. With the One Planet MBA, we are trained to ‘think what nobody has yet thought, about that which everybody sees’. A mindset and skillset that proved a provoking compliment to the Youth Fashion Summit experience, and thus an experience I would highly recommend to any MBA looking for a challenge and an enlightening investigation into an industry on the cusp of revolution. There is no time to waste, as these words turn into action throughout the course of this next year and beyond. As HSBC completes the world’s first commercially viable trade-finance transaction using blockchain, we ask our students: Is this a huge step towards efficiency and reducing errors in the funding of international trade, or does this undermine cryptocurrency’s value and decentralised character? Georgie Hazell, MBA Participant 2018: “The clarity offered by regulation would probably increase the perceived legitimacy of virtual currencies. My vote is for regulation [acting like a] speed-bump in the short term, but an incentive in the longer term, boosting value and offering protection for investors. Speculation around regulation will probably cause greater volatility in the bitcoin price than actual implementation. 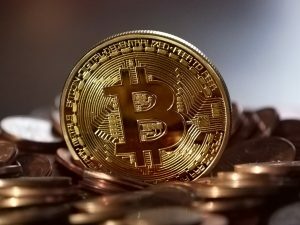 When investors are unsure about the legitimacy of their cryptocurrency and how they are going to be taxed when they sell it, they will probably avoid or at least hold it until clarification is given. Gana Alampalle, MBA Participant 2018: “Bitcoin’s value lies in being an anonymous, effortless and secure payment system…in theory. This is also true for the numerous ‘alt-coins’ that have cropped up aiming to penetrate the market, each with their own USPs. It’s hard to see what real value that cryptocurrencies would offer if they were to be regulated. Prices would decrease substantially if anonymity were to be taken away. To add to this, hard-line regulations could potentially push cryptocurrencies further underground into the dark web where they would inevitably be traded illegally and continue to promote illicit activities.